Crystal Palace fought back from two goals down to fellow strugglers Norwich City to keep their hopes of Premiership survival alive. 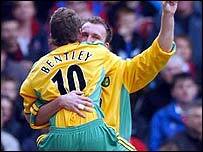 Palace took the lead when Joonas Kolkka drilled home Michael Hughes' free-kick before Norwich's Dean Ashton levelled. Ashton fired in a second from the edge of the area immediately after half-time and Leon McKenzie converted Darren Huckerby's pass for Norwich's third. But a Hughes header and an Andy Johnson penalty late on earned Palace a point. Southampton's defeat to Villa means the draw wasn't as costly as it could have been for Palace or Norwich. The Eagles move evel with the Saints on 27 points, one behind West Brom who have a game in hand, with the Canaries three further back on 24 points. Palace made the perfect start, setting a blistering pace to this relegation six-pointer. Dougie Freedman was fouled by Thomas Helveg on the left side of the penalty area. Hughes whipped in a curling free-kick which evaded the Norwich defence and fell at the feet of Kolkka who smashed in his shot from a tight angle. The home side settled well and played the better football in a busy opening period. Freedman, who forced a brilliant save from Robert Green, thought he should have won a penalty when he was shoved by Jason Shackell. Top-scorer Johnson was also felled and Youssef Safri appeared to handle the ball on the Norwich line but referee Rob Styles waved away the appeals. Norwich rode their luck but made the most of their opponents' misfortune. They restored parity through Ashton's close-range finish after Damien Francis had powered into the area. Norwich came out of the blocks fastest after the break, and Ashton scored his second of the afternoon 11 seconds after the restart. Palace's defence crumbled once more as Huckerby wriggled his way into the area and laid on the perfect pass for McKenzie to slot home Norwich's third. But the Eagles refused to let their heads drop, and Hughes reduced the deficit with an expertly-placed header past Green from Johnson's pin-point cross. And Johnson was eventually rewarded for his endeavour. The Palace striker raced into the Norwich area but was brought down by Shackell, falling awkwardly on his head. Johnson, however, got up to take the penalty and coolly fired it past Green. But the Norwich keeper then made a brilliant save to deny Fitz Hall at the death. "This result keeps a good cushion between us and them because there is still a three point gap. "In the first half we were great and were unlucky to be level at the break but they came out well after the break. "The heart and the spirit of the lads was brilliant and we need to take that on into our next game with Blackburn." "We have to look at as a point gained but we are disappointed that we did not hold no for what would have been a vital win. "The performance of Robert Green in goal was outstanding as were Dean Ashton and Leon McKenzie up front. "There are lots of positives but we have to learn to close matches out." Crystal Palace: Kiraly, Butterfield (Torghelle 72), Hall, Sorondo, Granville, Routledge, Leigertwood (Soares 65), Hughes, Kolkka (Popovic 84), Johnson, Freedman. Subs Not Used: Speroni, Riihilahti. Goals: Kolkka 5, Hughes 73, Johnson 83 pen. Norwich: Green, Helveg, Fleming, Shackell, Drury, Francis (Holt 88), Safri, Bentley, Huckerby (Jonson 90), McKenzie (Svensson 88), Ashton. Subs Not Used: Ward, Doherty. Goals: Ashton 22, 46, McKenzie 53.